Dinner at Duddell’s, Hong Kong, in Oct 2018. 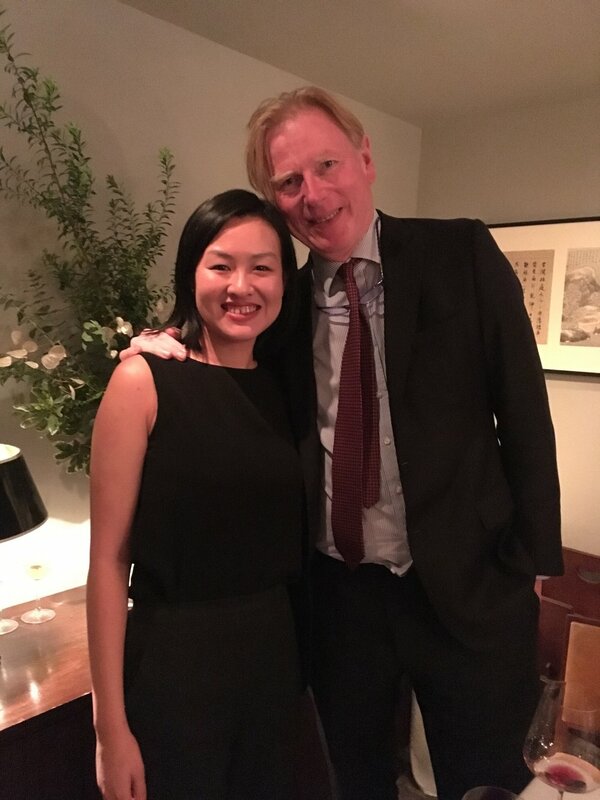 Last week I was incredibly lucky to score a seat at The Fine Wine Experience’s Hospice de Beaune Burgundy Dinner with Jasper Morris MW, current consultant to Hospice, and François Poher, Head of Hospice de Beaune. As you know Jasper Morris MW’s Inside Burgundy is a must read for any Burg geek out there and still serves as the ultimate guide to the region since it’s original publication in 2010. Since retiring from BBR last year, he is now working as as consultant as mentioned but also his own platform, Inside Burgundy, which will include Burgundy tasting notes and more, launching latest before 2017 Burgundy EPs are out in Jan 2019. Morris and Poher took turns explaining the history of the Hospice de Beaune auction (charity and raising funds for the hospital) and the latest 2018 vintage thus far (looking to be quite good ahead, a cool and balanced vintage a la 2017). Both spoke highly of new regisseur of the Hospice since 2015, Ludivine Griveau and they are superbly confident in her creating another great vintage for auction later this year. With François Poher in Hong Kong, Oct 2018. With Jasper Morris MW in Hong Kong, Oct 2018. I have tasted many Hospice de Beaune wines from many different eleveurs and find them to be pleasant but perhaps not the most exciting Pinot Burgundy has to offer. However finally having tried pure Hospice de Beaune wines — as in no eleveur, just their library stock from this dinner — I have grown a much better understanding and thus appreciation for the wines. The wines were strong in oak, which Japser Morris MW explains as new barrels are used for all cuvees and are auctioned off with the wines. This makes complete sense but not altogether intuitive when tasting (duh!). 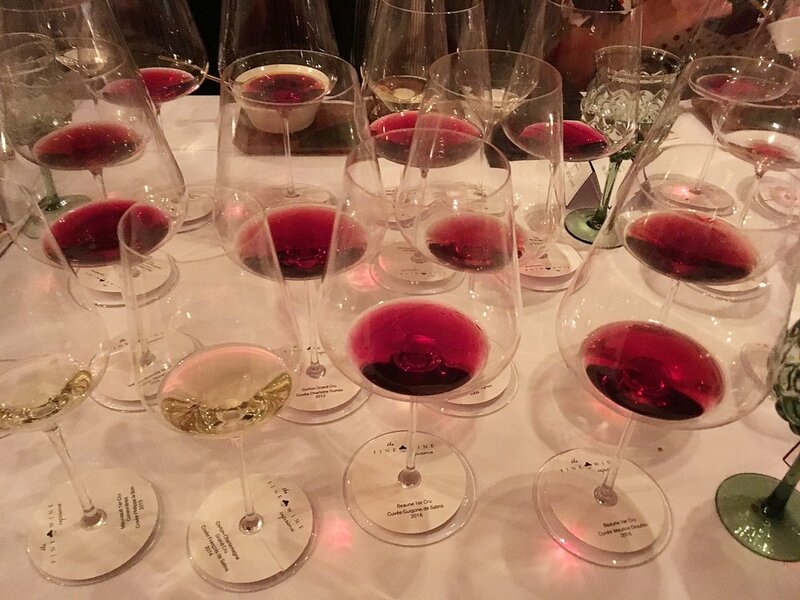 Terroir is obvious though underneath the oak and clearly the vintages they picked were more than strong enough to withstand it (2016, 2015, 2012, 2009 and 2002). However at the same time, due to the strong oak, it is harder to taste some of the newer wines and many of the grand crus only opened at the end of the dinner, namely the Clos de La Roche 2002, which became S-T-U-N-N-I-N-G. Picking the correct eleveur is certainly the most decisive factor in the end result of the wines, however terroir still makes a big difference. Personally, the Beaune 1er Cru Cuvee Maurice Drouhin was WOTN for me. The story itself was compelling: Maurice Drouhin donated the parcel to the Hospice after they had successfully hid him from the Gestapo in 1944 while escaping through underground tunnels. Even more, it outshone the other Beaune 1er Crus and stood shoulder to shoulder even against Mazis Chambertin, which Francois Poher considers the top parcel of the Hospice. Hospice de Beaune are worth buying and not just for the ego of having your own custom labels. If you have the privilege of a top eleveur such as Leroy, Liger-Belair, De Montille or even Roumier, these can be definitely considered great value for drinking buys relative to their respective domaine wines. The extra benefit is of course doing good for charity while enjoying fantastic wines — isn’t that the best of both worlds? 2015 Meursault 1er Cru Genévrieres, Cuvée Philippe le Bon: Quite oaky on nose, very tight and not much is discernible. On palate, it is very generous and giving with great acidity, minerality and complexity reflective of the exceptional terroir offered by this climat. Seriously who has ever had a bad Meursault 1er Cru Genevrieres? 2014 Corton-Charlemagne Grand Cru, Cuvée Francois de Salins: A huge contrast to the boisterous Meursault, this was much more aromatic and elegant. Definitely a better example than the average Corton (which can end rather disappointing for a grand cru White Burg). Full of lemon peel zest and saline notes on the nose, in the mouth it was similar with beautiful acidity and very fine long finish. 2016 Beaune 1er Cru, Cuvée Guigone de Salins: Being very young, it’s not super expressive on the nose however it was pleasing with its bright crunchy cherry notes. Super acidic but it was punchy and fun with soft supple tannins. 2016 Beaune 1er Cru, Cuvée Maurice Drouhin: This was easily WOTN for me. Why? Rich and luscious immediately on the nose, with expressive and layered red fruit, plum, sweet spice and tobacco in the mouth. I adore depth and dimension to my red Burgs and this really delivers. It is bold but with restrained finesse, clearly outperforming its classification. Really nice stuff that I hope to get for myself. 2015 Volnay 1er Cru Santenots, Cuvée Gauvain: This is a great 1er cru so I am surprised it was underperforming on the night. People do say the 2015s are shutting down already so this might be the case here. The nose was not open and the palate was not altogether expressive however I don’t think one should completely write off on this particular cuvee. It just needs time. 2012 Corton Grand Cru, Cuvée Charlotte Dumay: I am biased because Corton is (almost) forever mehhhhh grand cru. This was super tight and youthful despite some age, not particularly expressive but plummy with darker berry notes. 2009 Mazis-Chambertin Grand Cru, Cuvée Madeleine Collignon: Very tight at first and hard to open. Pretty rich berry fruits start to show after an hour in and it’s clearly supremely youthful at 9 years of age. It has great potential but with all oak, it will need some time to come around. Lovely though. 2002 Clos de la Roche Grand Cru, Cuvée Georges Kritter: This another super dense wine that did not show off again until the evening was almost over. Definitely worth the wait as it was rich with impossible depth and complexity. Within the well structured silky tannins lay notes of cherry, raspberry and bramble. Though this climat is known for its musty barnyard notes, it was surprisingly pure and clean from beginning to finish. It was still like the 2009 Mazis youthful with barely any tertiary mushroom notes showing. Gorgeous wine to keep for another 5-10 years. Thank you The Fine Wine Experience for holding such a great dinnner!